Original content posted March 2015. Updated January 2019. I’ll be honest, my husband’s work schedule is no fun at all. Many times we’re cancelling or rescheduling activities or trying to schedule activities around his call schedule. As we got married the first week of med school, it’s something that I’ve become used to, but it’s still not any fun to deal with. These Peanut Butter Cup Stuffed S’mores Brownies are hands down the best – and sweetest! – thing to have ever come from cancelling plans. Late last fall, we had made plans to have a s’mores party with our friends that live down the street. I had purchased all the ingredients – including peanut butter cups and both milk and dark chocolate – so that each person could make their own unique dessert concoction. Then I got the dreaded text from my husband saying that he was going to be late. So our party plans were scrapped for another day. Unfortunately, the weather turned colder and we never got around to having our party. A few months later, I found the bag of s’mores ingredients in the pantry and was trying to figure out how I could use them. My mind immediately went to brownies. I absolutely adore homemade brownies and my One Bowl Chocolate Fudge Brownies recipes was the jumping off point for these Peanut Butter Cup Stuffed S’mores Brownies that are is absolutely out of this world! A thick graham cracker crust acts as a base for these decadently delicious brownies that are then topped with a rich, chocolate brownie batter. Peanut butter cups and pieces of a dark chocolate candy bar are then pressed into the brownie batter before being baked. And of course, you can’t have smore’s anything without marshmallows! 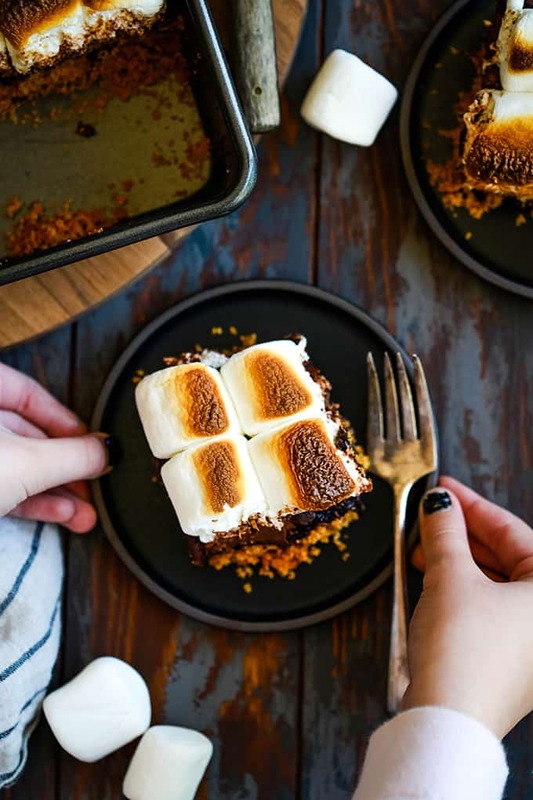 Large jet-puffed marshmallows are then dotted over the top of the brownies and broiled to toasty perfection. 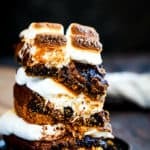 Fellow s’mores lovers will also no doubt love my super chocolatey S’mores Stuffed Chocolate Krispie Treats, incredibly easy Double Chocolate No Bake S’mores Pie and Angel Food Cake S’mores Skewers – perfect for a night around the fire pit! If you’re on the hunt for additional s’mores brownies, my Dulce de Leche Swirl S’mores Brownies are always a crowd pleaser. In a small saucepan over low heat, melt butter. Remove from heat. 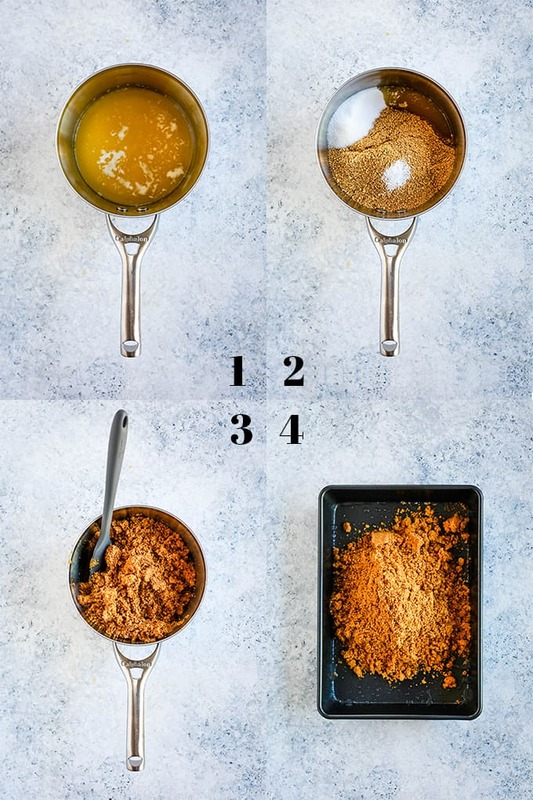 Add graham cracker crumbs, sugar and salt to saucepan. Press graham cracker crumb mixture into an even layer. In a large saucepan over low heat, melt butter. Add cocoa and coffee to melted butter. Press peanut butter cups into brownie batter in three rows of four. TIP: To avoid having the s’mores brownies being overly sweet, I love to use dark chocolate peanut butter cups from Justin’s or Chocolove. Break the candy bar into individual pieces and place in horizontal and vertical rows between peanut butter cups. Bake for 18-20 minutes or until just set. Add marshmallows to top of brownies pressing lightly to adhere them to the warm brownies. Broil for 2-3 minutes or until they reach desired char level. TIP: Keep your eyes glued to your brownies! Once they start to brown they’ll go from lightly tanned to charred in just seconds. TIP: If you want to be fancy or simply want more control over the marshmallow toasting experience, you can also used a handheld kitchen torch. If you’ve tried these Peanut Butter Cup Stuffed S’mores Brownies or any other recipe on Melanie Makes, please let me know your thoughts in the comments below. I love hearing from you and respond to each and every comment! 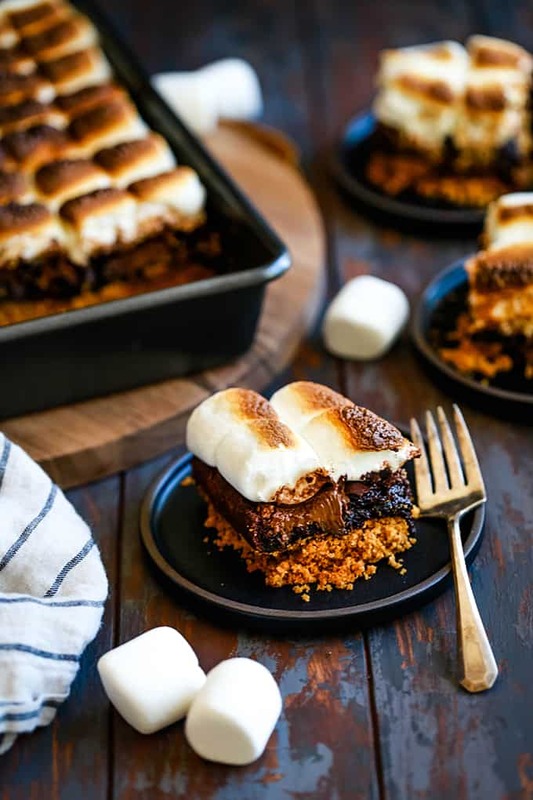 There’s no campfire needed for these Peanut Butter Cup Stuffed S’mores Brownies! A thick graham cracker crust base is topped with a rich brownie batter, peanut butter cups, dark chocolate candy bar and large jet-puffed marshmallows. Decadent and delicious! Pour mixture into prepared pan and press into an even layer. 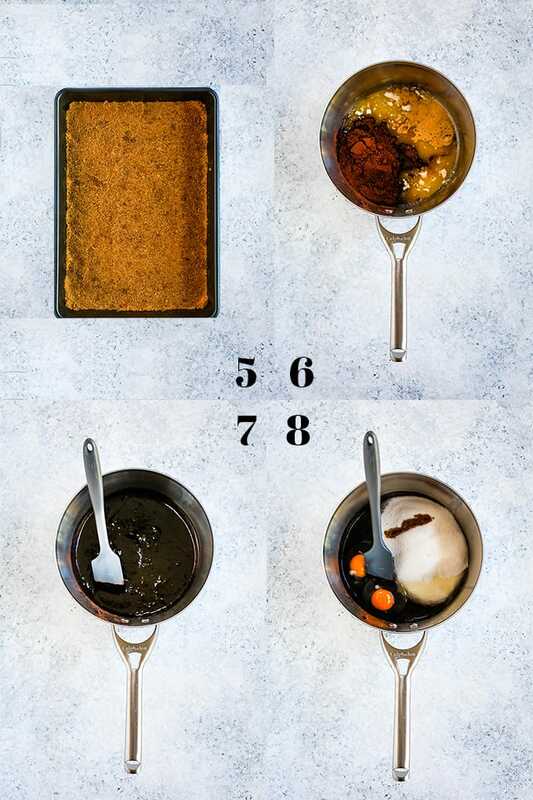 Bake for 12-14 minutes or until set and beginning to brown. Bake for 18-20 minutes or until just set. Remove brownies from oven and turn oven to broil setting. Add marshmallows to top of brownies pressing lightly to adhere them to the warm brownies. TIP: To avoid having the s'mores brownies being overly sweet, I love to use dark chocolate peanut butter cups from Justin's or Chocolove. TIP: Keep your eyes glued to your brownies! Once they start to brown they'll go from lightly tanned to charred in just seconds. Since I’ve declared myself a founding member of S’mores Anonymous, I’m looking to try these decadent S’mores Chocolate Chip Cookie Cups, these salty sweet Pretzel S’mores and these simply adorable Owl S’mores next. Thanks, Kayle - my menagerie always loves these! Love these! Can't wait to try them! Oh yum! These are gorgeous! Holy Moly these are amazing! My favorite dessert married with my husband's favorite! A definite win for your house, Angie! All my favorite things in one! This is my new favorite dessert! Mouth watering! What a great idea to make this flavor combo. My kid will love it! I'm sure they will, Catalina! This is next level brownie amazingness! I cant see anyone not wanting to eat the whole tray! You're so sweet, Demeter - thank you! 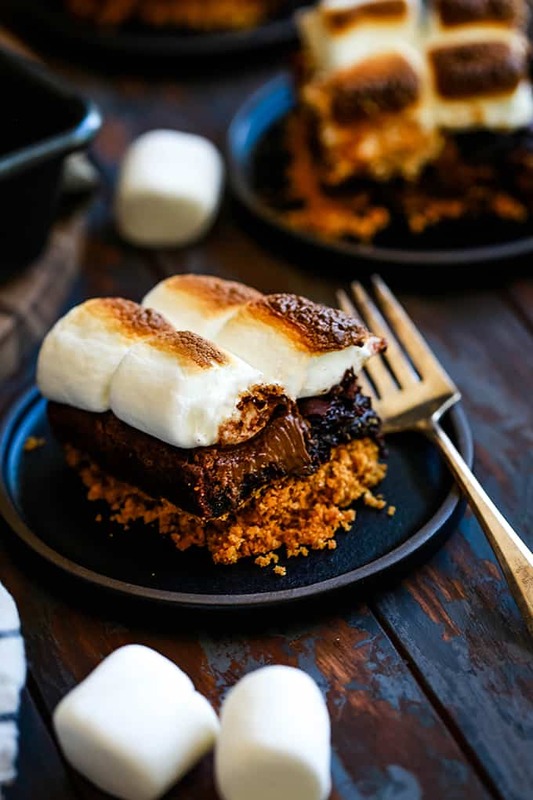 Never seen s'mores brownie before.. this is seriously such a creative (and delicious) recipe! Hi there! 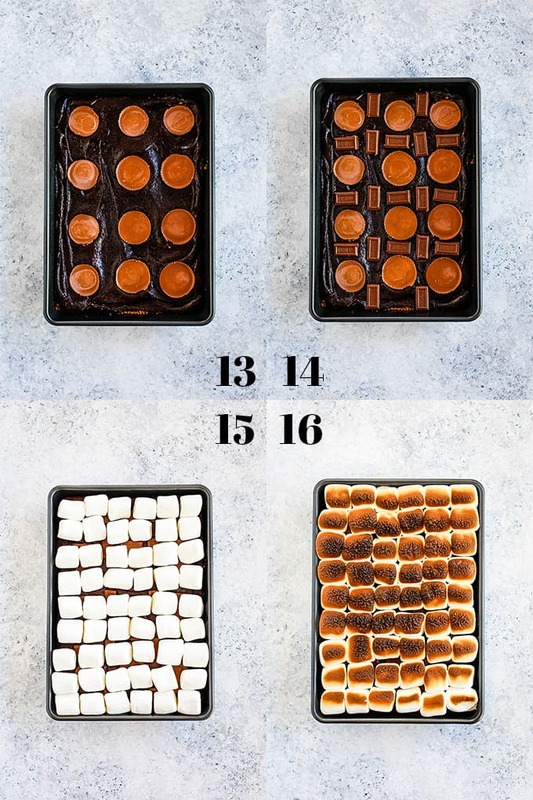 I was very excited to try these brownies but something weird happened during the prep.,Put the brownies in the oven in broil setting and the marshmallows instantaneously burst into flames. The brownies were still pretty good after we controlled the blaze and quieted the fire alarm. 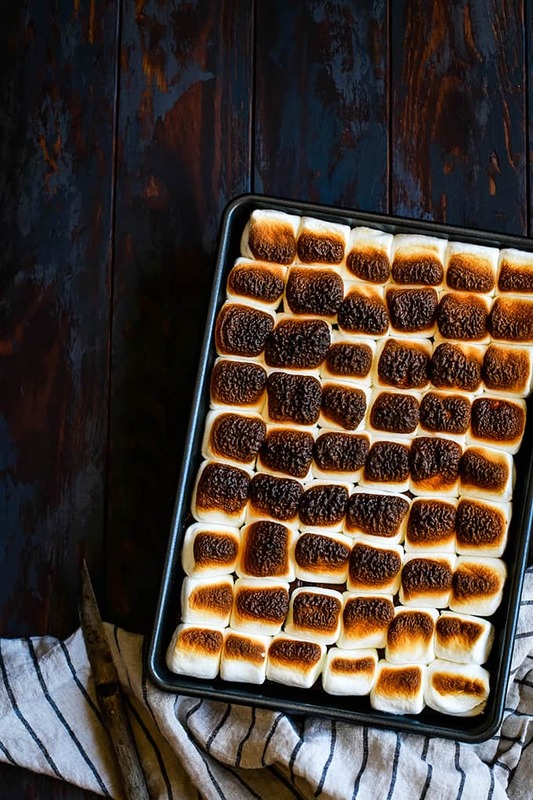 Hi, Morgan - I'm wondering if your baking pan was positioned too closely to the broiler element and that is what caused the marshmallows to catch fire? Can you make these ahead and freeze? I want to package these up for A baby shower favor but I need something I can make day ahead Or now and freeze . HEY! THESE ARE IN THE OVEN NOW - THEY LOOK AMAZING!!! I'M GOING TO LET THEM COOL COMPLETELY AS I'M TAKING THEM TO WORK TOMORROW. THEY JUST STAY COVERED IN THE DISH OVERNIGHT, NOT IN THE FRIDGE, RIGHT? Hi, Jessica - Yes, you can just leave them covered on the counter. No need to refrigerate! Can't wait to hear what everyone thinks! I live in Denver, any suggestions on adjustments for altitude? Hey, Shay! Waving at you as we're in Colorado now as well! I've noticed since being here this summer that I haven't had to make any real adjustments other than cooking times. Adding a few minutes should do the trick! I made these and took to a family dinner. They were awful. When you tried to cut them the whole marshmallow topping came off with the knife..they were so sweet no one could eat them. I was so disappointed with them. I have been baking for over 50 years and followed the recipe exactly. I threw the whole panful in the trash. Hi, Janie! I'm so sorry you weren't happy with this recipe as it's definitely one of our favorites. It's actually one of my most popular and most Pinned recipes as well. S'mores are definitely sweet and this recipe is definitely best enjoyed in smaller portions! Can I use a milk chocolate bar instead of the dark chocolate bar? I tend to shy away from brownies when they're too dark, they tend to be too bitter for my palate. These brownies look so good, I want to try them. You absolutely could, Jewells! My personal preference is dark as I tend not to like things too sweet but if you prefer it, go for it! Just remember that the peanut butter cups and marshmallows are also quite sweet so the dark chocolate helps to temper them a bit. Let me know if you give them a try! Hi I am wondering if you could use a brownie mix instead or would it change the texture or consistency? 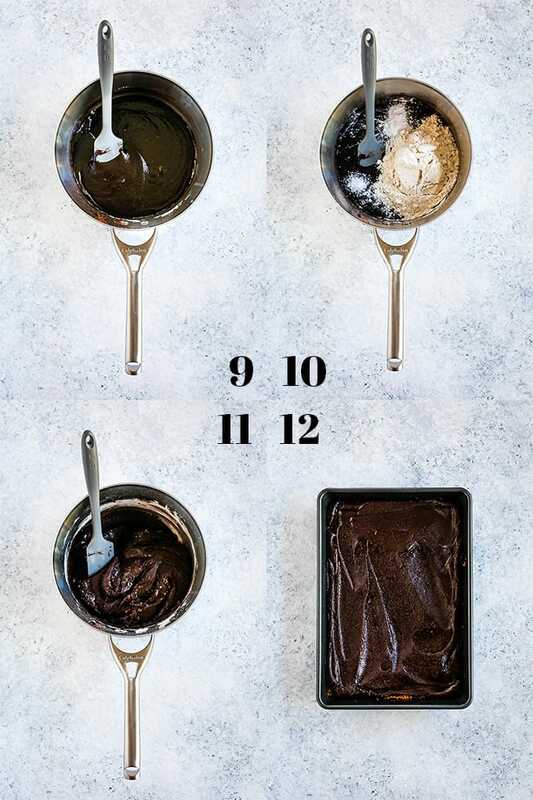 Those brownies look pretty Ooey gooey! Also, do the marshmallows stay gooey if you make a day ahead? Hi, Rochelle - I've never used a brownie mix for this recipe so I can't say for certain. The marshmallows wouldn't be as gooey if you make them in advance so I'd try and make them the same day that you are serving, if possible. Erin, this comment made my entire week. So glad that you and your family enjoyed them and thank you for taking the time to let me know! So appreciate it! Is there a quick food delivery for this one? I really want to try this one now! Can I take them all, please?! They look so amazing. This is exactly what I need to calm my nerves! For sure, Dad will love these Peanut Butter Cup Stuffed S’mores Brownies of yours Melanie. Thank you so much for the share! Thank you for this recipe. I saw it this morning and went right to the grocery store to make it. They are beyond delcious and super easy to make! So glad you enjoyed them, Kelly - they're decadently delicious! Do you mean cocoa powder? Hi, Erica -Yes, the recipe calls for cocoa powder. Girl, you better stop! These are INSANE!!! I'm pretty sure I dreamt about these last night!! Someone - Anyone - Fan me!! Oh my goodness. I could eat a pan of these!! These look amazing and so soft and your right, who needs a camp fire when you can make these. I am all over these brownies. I need to make these asap. Pinned. These are like the brownies of my dream! All the layers and flavors GAH. I could eat 10... like right now. Wow! These are amazing looking brownies!! Pinning. 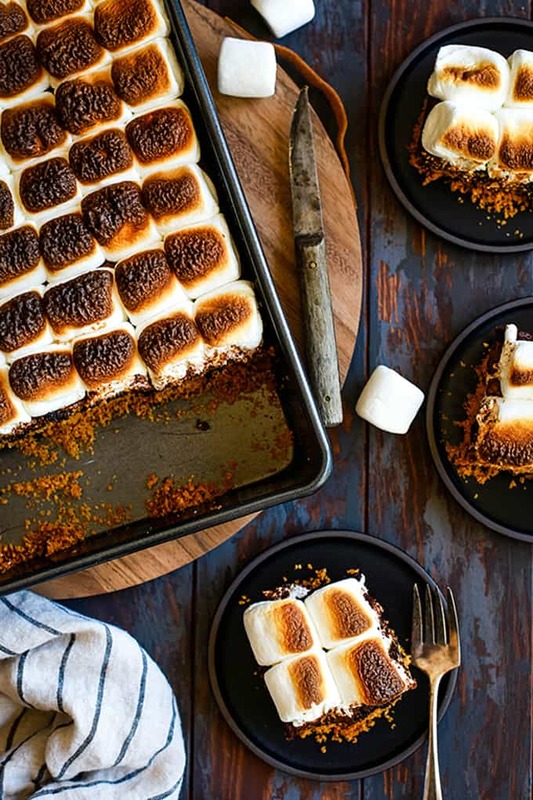 The images of these smore brownies are just INCREDIBLE. You totally have enticed me here with your delicious photography! These are incredible looking. No one could resist gobbling up the whole darn pan. Oh my gosh my jaw literally fell when I saw this. These look so decadent and amazing! Holy cow!!!! I would love to devour this entire stack of brownies!!! Everything I love in one amazing brownie! OH my goodness Melanie. You are the brownie queen!Love that you were going to have a smore party with your friends, best party ever! These look and SOUND incredible! I would love to reach through my screen right now. Delicious! Oh man. I could eat every last one of these!! I'd be okay with cancelled plans if thee brownies were waiting for me :) simply amazing Melanie!! Whoa. These are MY kinda brownie! 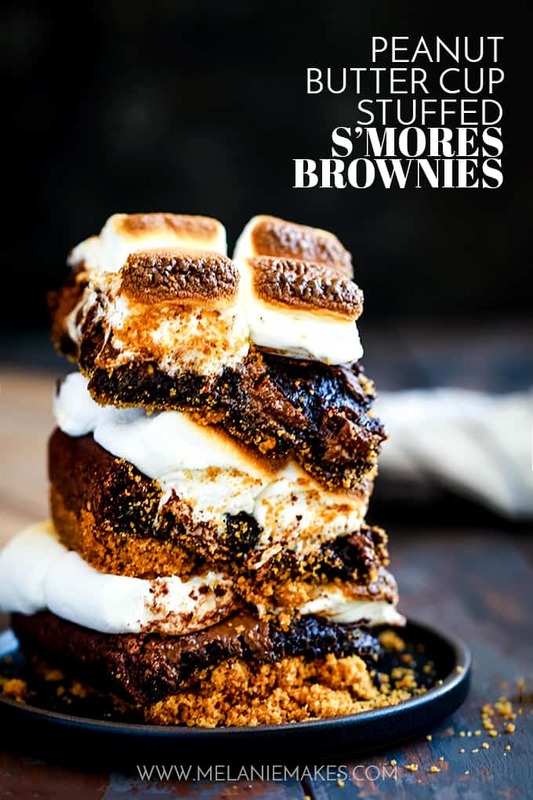 I love anything smores then you added a fudgy brownie in? I am dead. Wow, these look amazing! Need to try them asap! Crazy! I mean I want to dive into my computer screen and devour all of these brownies!! Great recipe! I think this is the best thing that's ever come of plans being cancelled! !